Kylian Mbappe won the Kopa Trophy on Monday in Paris at the star-studded Ballon d’Or ceremony. Mbappe enjoyed a brilliant year for both club and country, helping PSG win yet another Ligue 1 title and firing France to victory at the World Cup in Russia this summer. And his astonishing rise has seen him land yet another award, winning the inaugural Kopa Trophy, which is handed out to the world’s best male footballer under the age of 21. And following his latest triumph, Mbappe – who also came fourth in the Ballon d’Or standings – has set his targets even higher, claiming he wants to win everything in the game. 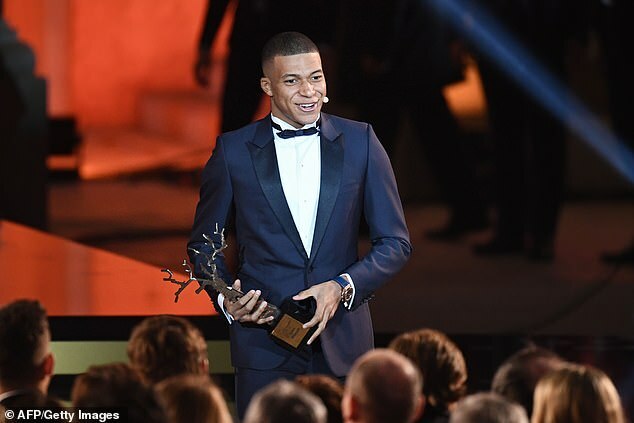 ‘I am very happy to receive this award,’ Mbappe said at the Grand Palais in Paris. ‘This rewards a great year, which I realise is thanks to all my team-mates in club and national team. ‘I will never forget the adventure of the World Cup. It’s a good time to thank them. And it’s an extra motivation to keep working. Borussia Dortmund youngster Christian Pulisic came second behind Mbappe after enjoying another fine season in Bundesliga. And after finishing runner-up, the USA international took to Twitter to reveal his delight.